If salaried employees are paid less than the overtime salary threshold (currently $23,660 in annual salary), they are entitled to overtime pay when they work more than 40 hours in a week. If however, they make more than the salary threshold, they are entitled to overtime pay only if their primary duty is not executive, administrative, or professional. 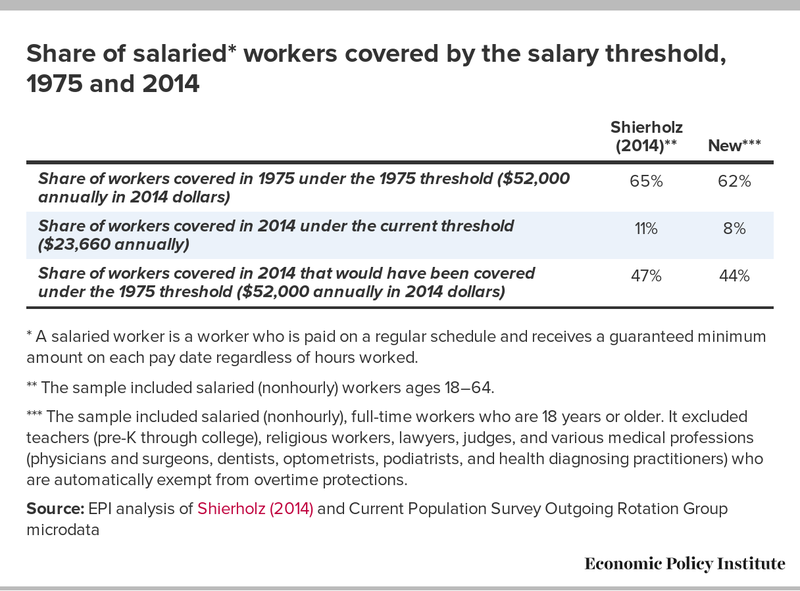 In a 2014 analysis, former EPI economist Heidi Shierholz estimated the share of salaried workers who were covered by the overtime salary threshold in 1975 and in 2013. She found that, despite an increase in the threshold in 2004, the share of the workforce covered by the threshold declined from 65 percent in 1975 to just 11 percent in 2013. This is because most of the value of the threshold was eliminated between 1975 and today due to inflation. As a result of Shierholz’s findings, EPI recommended that the overtime salary threshold be increased to the 1975 threshold in today’s dollars (in 2013, this was $51,168), which would have covered 47 percent of the workforce. Because the analysis focused solely on the salary threshold test–i.e., because the analysis focused on just the salary of workers without regard for the duties of their occupation–increasing the threshold to reflect an amount into today’s dollars wouldn’t mean that all of the workers who fell in between $23,660 and $51,168 would gain overtime protections. Many of these workers would already have been entitled to this protection because their primary job duty was not executive, administrative, or professional. Now, in updating this analysis, we want to be as precise as possible in identifying the workers who will be affected by the updated salary threshold rule. To do this, we narrowed the sample to those workers who are full-time workers (usually work 35 hours or more at their primary job), expanded the age of the population to all workers 18 years or older (previously limited to those 18-64), and removed certain occupations that are automatically exempt from overtime protections (e.g., medical professionals, lawyers, judges, teachers of all levels, and religious workers). The figure below compares the results of Shierholz’s original analysis and our updated analysis. In our updated analysis, the share of workers covered in 1975 drops to 62 percent from 65 percent. For the most recent year now, 2014, we find that 8 percent of workers are covered under the current salary threshold. If the salary threshold were updated to the 1975 level in 2014 dollars ($52,000), 44 percent of the workforce would be covered. Again, some workers falling in between the current salary threshold and proposed salary thresholds may already be receiving overtime pay because they don’t perform executive, administrative, or professional work, but the salary threshold independently guarantees these workers the right to earn overtime pay and avoids the confusion of assessing the duties-based exemption of those workers. * A salaried worker is a worker who is paid on a regular schedule and receives a guaranteed minimum amount on each pay date regardless of hours worked. ** The sample included salaried (nonhourly) workers ages 18–64. *** The sample included salaried (nonhourly), full-time workers who are 18 years or older. It excluded teachers (pre-K through college), religious workers, lawyers, judges, and various medical professions (physicians and surgeons, dentists, optometrists, podiatrists, and health diagnosing practitioners) who are automatically exempt from overtime protections. It can be difficult to infer the likelihood of various occupations qualifying as exempt/nonexempt based on the duties test because as Eisenbrey (2015) suggested, many firms might treat workers as exempt despite their duties not actually qualifying as executive, administrative, or professional work.